(Haymarket, Va) We are proud to announce that effective immediately, Dale Parker will serve as the VSA Director of Coaching. Dale will be responsible for all travel related programs on a day to day basis and manage the overall vision of the club on the field with players and coaches. Having joined VSA in January 2015, Dale has been a vital part of VSA transitioning into what it is today. Initially serving as the Assistant Technical Director, Dale has also led the club's Pre-Academy programming, stemming through all aspects of the U11 through U14 age groups. "This is really a role that he has held for the past 18 months and now we are making this official and we look forward to the new ideas he will bring to the club" added Matt Lacey. 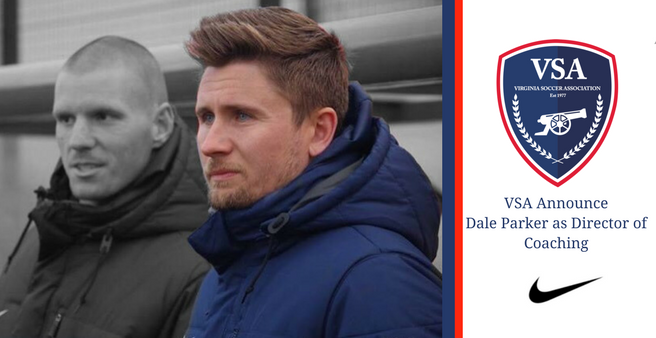 Dale brings a substantial amount of quality to the Director of Coaching role here at VSA, where one of the roles will be leading the clubs NPL teams/program. During the last 3 years, our NPL teams have experienced tremendous success garnering; 4 individual league titles, 3 National Tournament appearances, and 3 teams heading to the regional event this summer with the hope of advancing to the National Tournament. In addition, VSA has 7 teams in this year's VA State Cup Championship Final 4, with games taking place at the end of January. Prior to his 3 years here, Dale spent 4 years at Chesterfield United FC (now part of Richmond Strikers) as the Girls Director of Coaching, growing a program from 7 to 17 teams and being part of a very successful time for the club, and in particular for players moving into the college game.